A follow up report after a dog got electrocuted on Thanksgiving day. All in all Sparky,that is not too bad- only 45-. Man I can drive around the cities here and with out testing a thing find that many (probable) with in a 3 block area. I see more poles missing with conductors just taped up, in a line of poles. Perhaps 3 missing,I just know they are hot at night. In many areas the street lighting circuits are hot 24 hrs a day. In those installations the fixture has a removable twistlock photocell mounted to the top. Many are 480 volt as well. 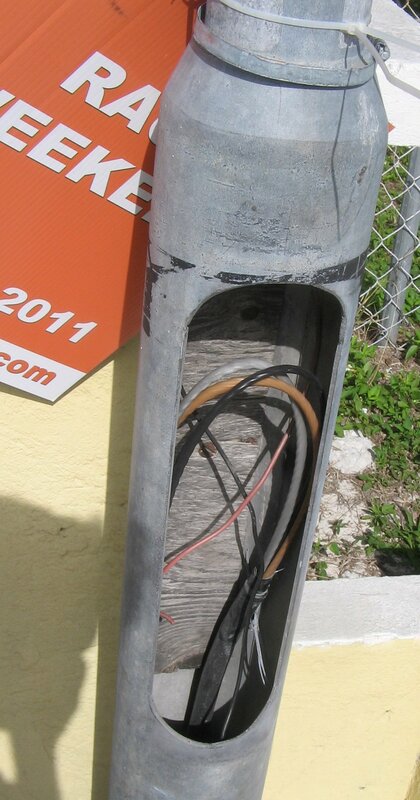 Much of the street lighting and traffic signal circuits in older cities is rubber insulated installed in fragile conduit called orangeburg, I believe. It is a wood fiber/asphalt or asbestos/asphalt or in some cases concrete pipe. Much of it has been crushed and damaged over the years. I worked on networking the 2500 traffic signals in Washington, DC back in the 80's--what a mess! I saw this in Nassau (Bahamas) on New Years day. Perfect height for an inquiring kid. Some cardboard and a couple more zip ties, they'd be set. Git er dun!